It includes return flight tickets and accommodation! Say goodbye to spending big bucks! Who says you can’t travel for less and not compromise your comfort at the same time? 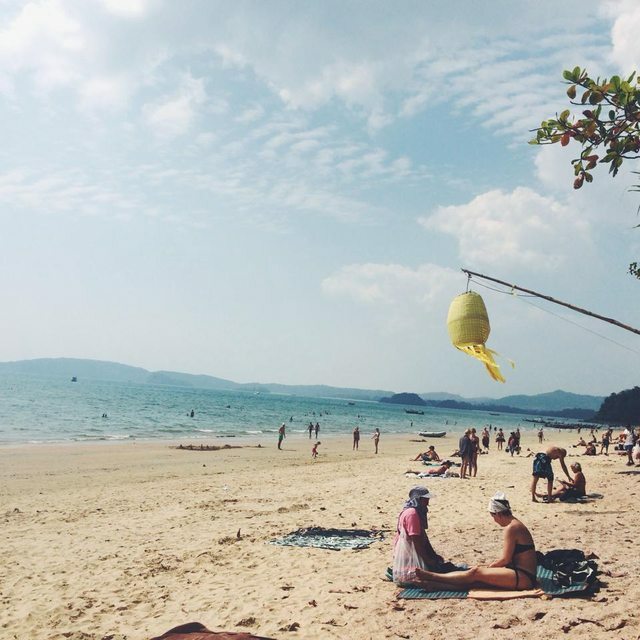 In January 2015, we travelled to the west coast of southern Thailand, Krabi for four days and three nights (4D3N). It was a much needed trip as we were in dire need of vitamin sea. The best part about it? 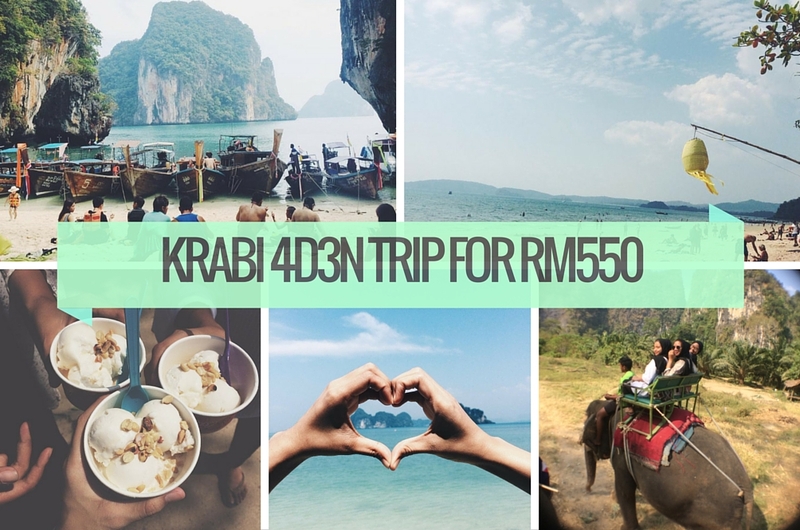 We did it with only a budget of RM550 including our accommodation and return flight tickets! It sounds too good to be true, huh? Don’t believe it? Here’s how we did it. 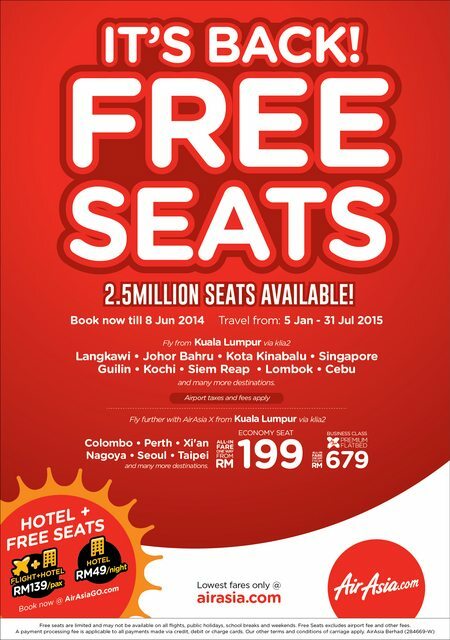 About six months prior to the trip, Air Asia was having its legendary free seats sale. 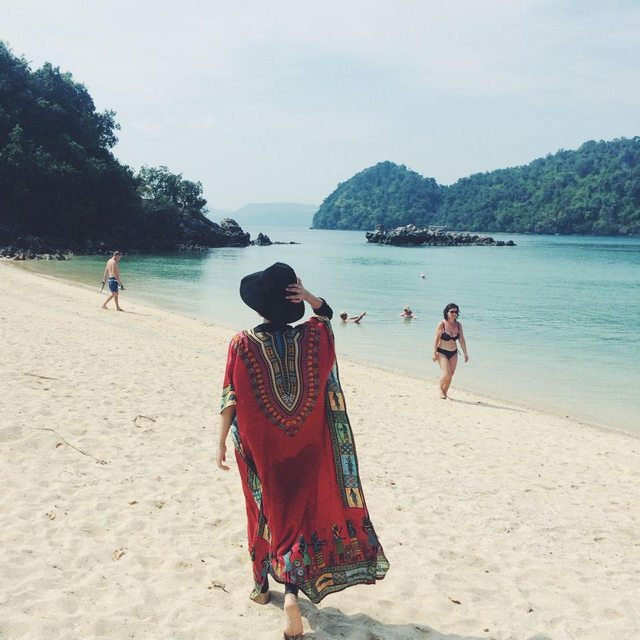 We decided to fully utilize the deal and searched for trip package via Air Asia Go. They had hotel deals as low as RM180 for 4D3N inclusive of flights tickets. 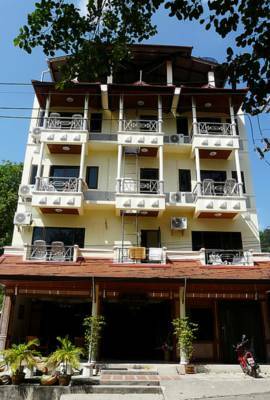 We did our research and decided to stay at Amorn Mansion, located nearby the Ao Nang beach which was only a five minutes walking distance from the hotel. Looks may be deceiving, but our hotel has a four-star rating on Trip Advisor and positive feedbacks from travelers. The price tag? RM250 only! 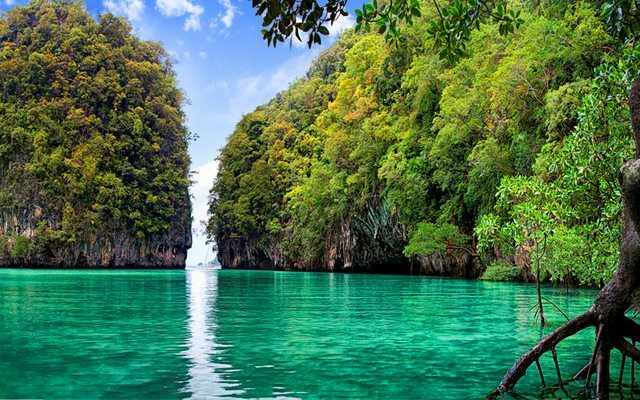 Few weeks before leaving for Krabi, we searched online for our airport transfer since our hotel does not offer that service. We were contemplating on taking a cab from the airport mostly due to the fear of being scammed or overcharged. 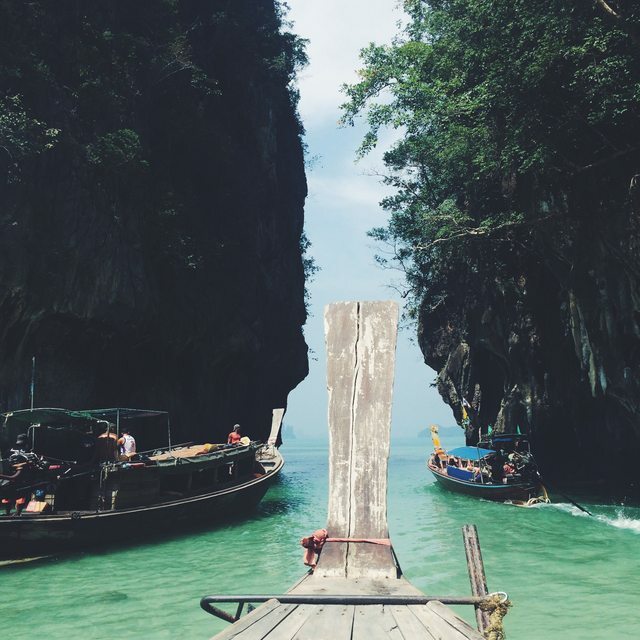 We then stumbled across Krabi Shuttle which you could book online without even paying a single cent! We had nothing to lose and went on and booked the standard minibus which costs 750baht (RM75) for one way (the cost will also depend on your hotel location). The minibus could fit up to eight people. 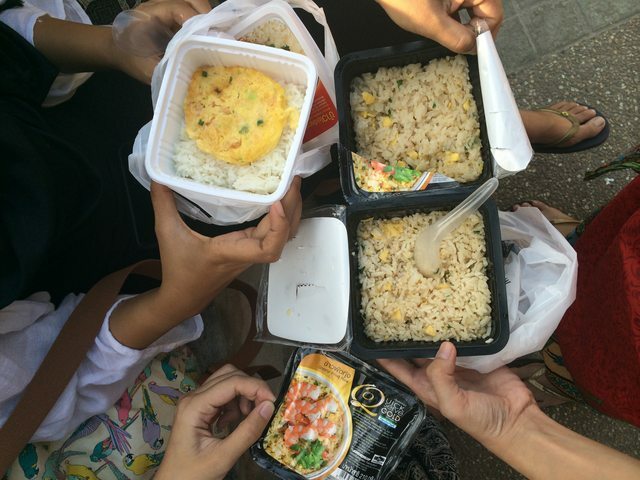 But since there was only the five of us, each person had to pay about 150baht (RM15). The currency rate during that year was 100 baht = RM10. We took an early flight at 7.15am and arrived at 7.30am since Thailand is about one hour behind us. We searched for our shuttle service guy and much to our relief, he did show up. We thought it was going to be some sad minibus but it exceeded our expectations when he showed up with a new minivan which was really spacious! To our amazement, the minibus even offered free Wi-Fi! 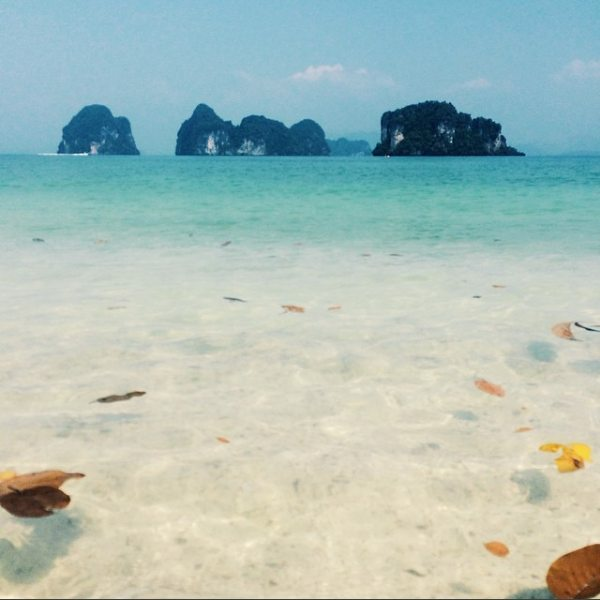 We then made our way to Ao Nang which took about half an hour. When we arrived, the hotel location was really good, it was smacked right at the center of the shops. The bad news? The steep hill we had to climb to reach the hotel. Thank God we packed lightly; imagine the horror climbing up with big, heavy luggage. We checked in and the room looked good and clean. They provided complementary Wi-Fi which had a stable and fast connection. Since we were early, we decided to roam the streets to look for breakfast and plan our trip. Most shops weren’t open yet, so we walked to all the way to the beach which surprisingly, was a mere five-minute walk from the hotel. It was clean with pristine waters. After some Instagram-worthy photo ops, we walked around to look for a travel agency. After much surveying, we ended up at a travel agency nearby the beach (we can’t recall the name of the company). 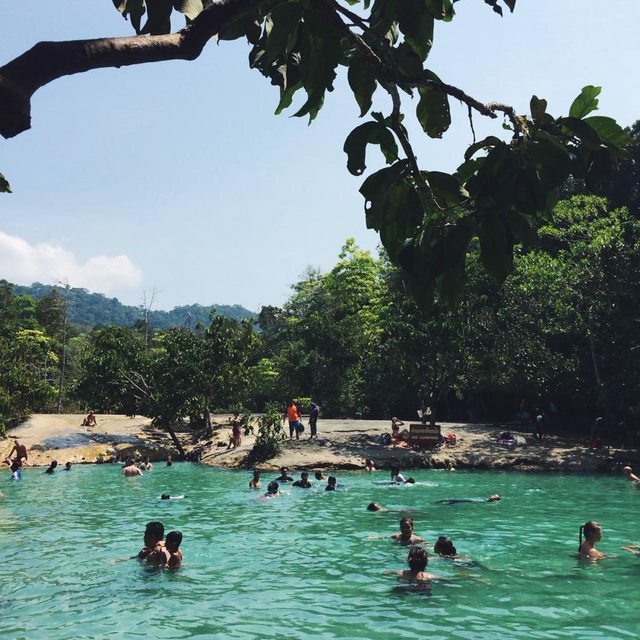 We took a two-day trip which included an island hopping trip for the first day and hot springs + emerald pool + elephant ride on the next day. We bargained with the agent and managed to get a really good deal. 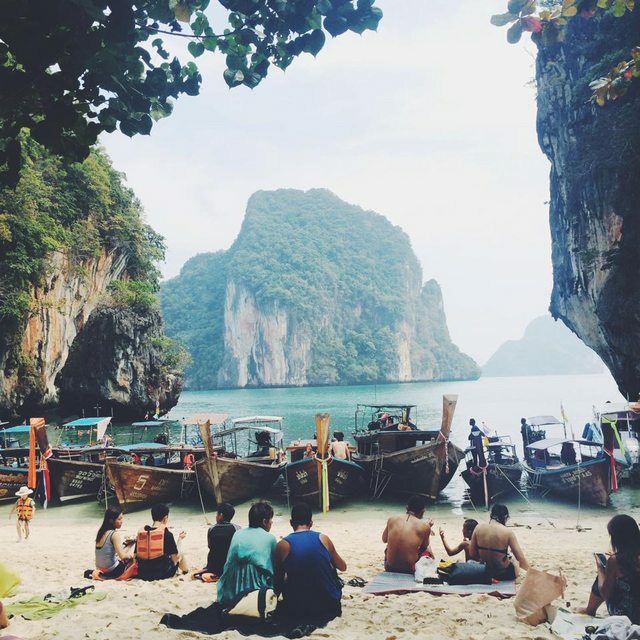 We paid 700baht (RM70) for the Hong Islands excursion and 900baht (RM90) for the second day trip. All of the trips are inclusive of the transportation for the tours, lunch, and insurance. It was almost noon by the time we were done and the sun was shining radiantly. We were starving, so we decided to have lunch nearby the travel agency. The food was good; we only regretted not surveying other restaurants as the food was quite pricey. We paid about 150-185baht (RM15-18.50) per person for our meal. If we were in Malaysia we wouldn’t even hesitate to say no after looking at the price. 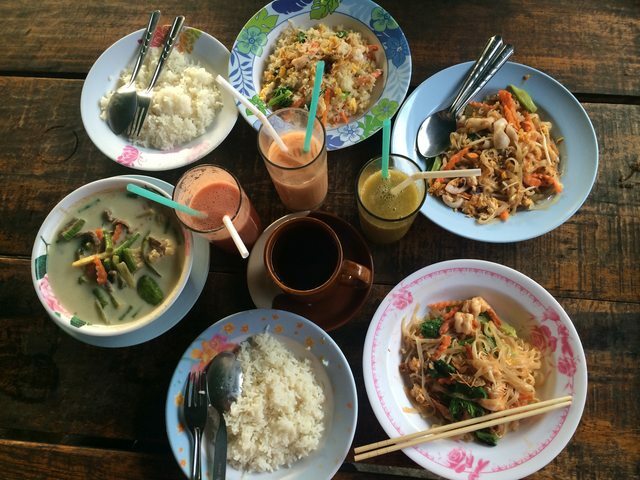 For Muslim travelers, do not worry as Krabi has an abundance of Halal restaurants ran by Muslim owners. We spent rest of the day window shopping and exploring the streets of Ao Nang. While waiting for our travel agent, we went to Family Mart for some breakfast. There was some frozen food that you could reheat and eat right away. We were in disbelief after looking at how cheap the price was, so we gave it a shot. The shrimp fried rice costs 35baht (RM3.50) while the rice with shrimp omelette costs 29baht (RM2.90) and it's certified halal. We had some reservations on how it tasted like but it was really good and cost saving! Our travel agent then arrived at 9am and we headed to the jetty. 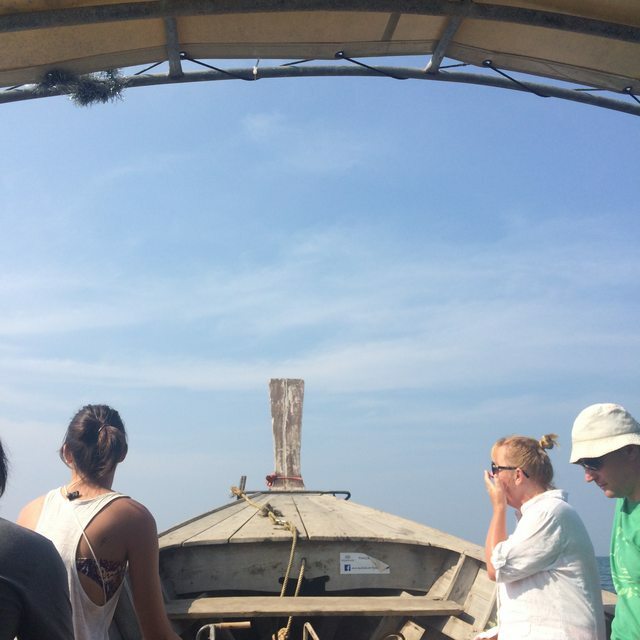 We boarded the long-tail boat (long-tail boats are cheaper than speedboats) and headed to our first destination, Daeng Island for snorkeling. When we arrived, there were a few other boats there as well carrying other tourists. Basically all of us were very penakut since this was our first time snorkeling and we had this fear of being attacked by all the little fishies. But in the end, it was now or never, so we jumped into the sea. We dived underwater and were amazed as it looked like something out of Finding Nemo. 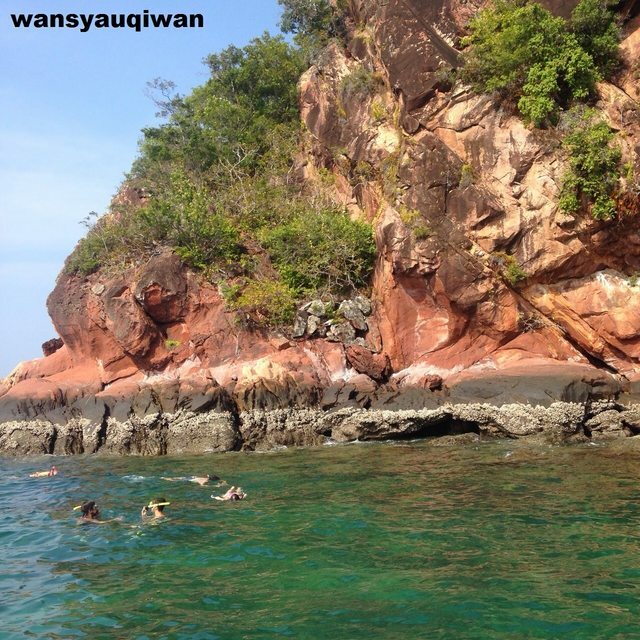 After about 45 minutes, we then headed to our next destination – Lading Island to snorkel and have lunch. Our breaths were literally taken away, the island was really beautiful and what better way to have lunch than with a scenic view. As mentioned earlier, lunch was provided. 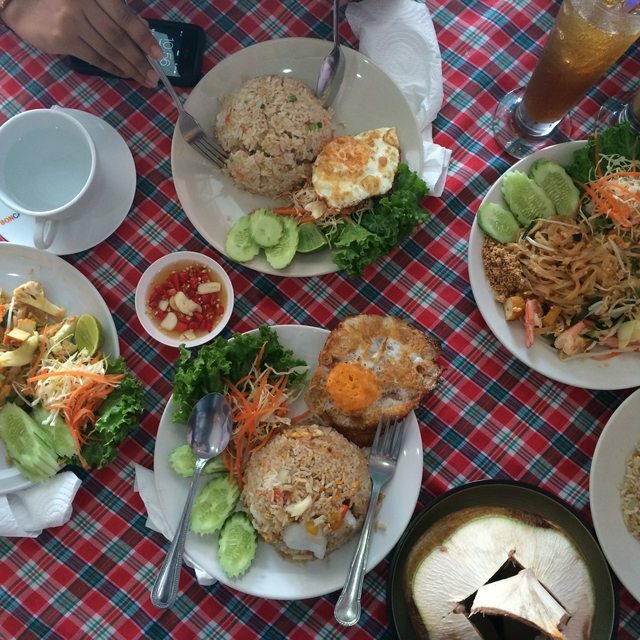 We were treated to some homemade nasi campur – Thai style. 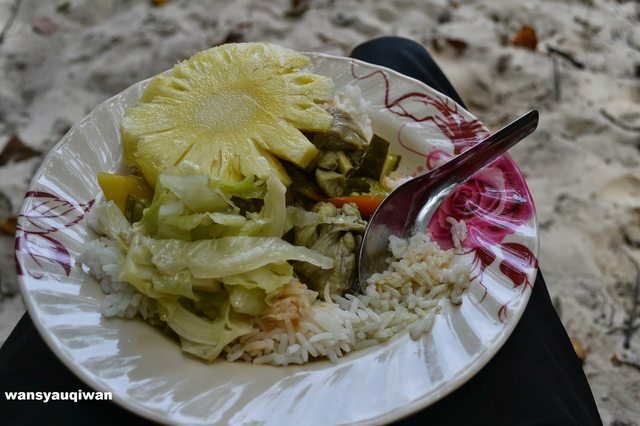 Green curry chicken, some vegetables and fresh pineapples satisfied our taste buds. An hour plus passed and we made our way to Hong Lagoon! The limestone structures were just magical. Hong means “room” in English which explains the limestone ‘door’ that we have to pass through in order to enter the lagoon. When we arrived, the tide was low. So we easily jumped off the boat and walked around the lagoon. Some tourists could also be seen kayaking nearby the lagoon. Maybe we’ll tick that off our bucket list next time. Look how fun it is! 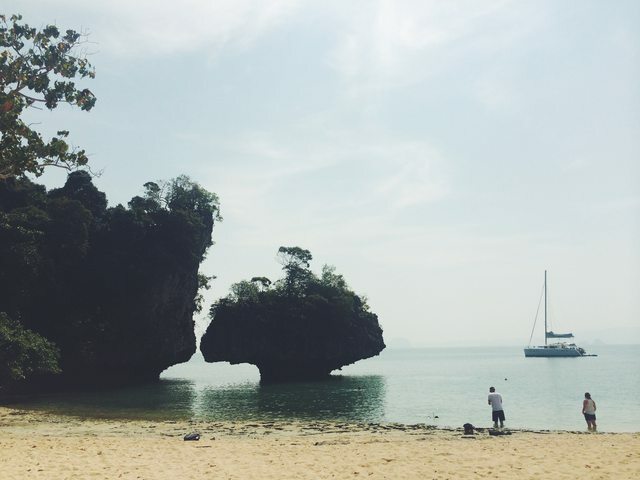 Before making way to our last destination, Koh Phak Bia, we stopped by another island nearby Lading Island. 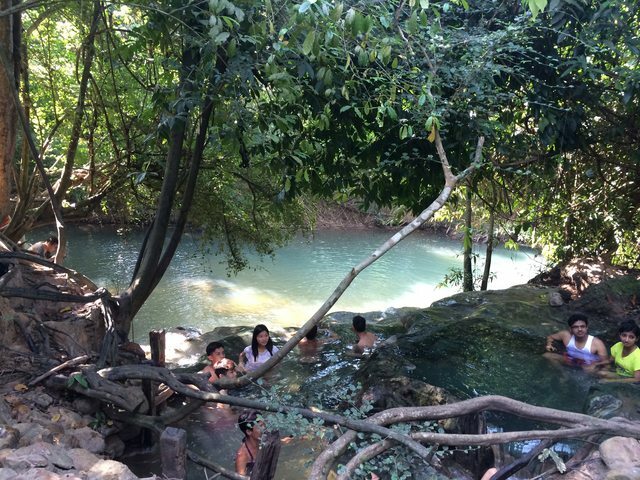 The waters were by far the clearest we’ve ever seen, it was literally like swimming in mineral water. We felt like crying at that point simply because we couldn’t believe how scenic it was. It was just a short pit stop and not many boats stopped by the island. 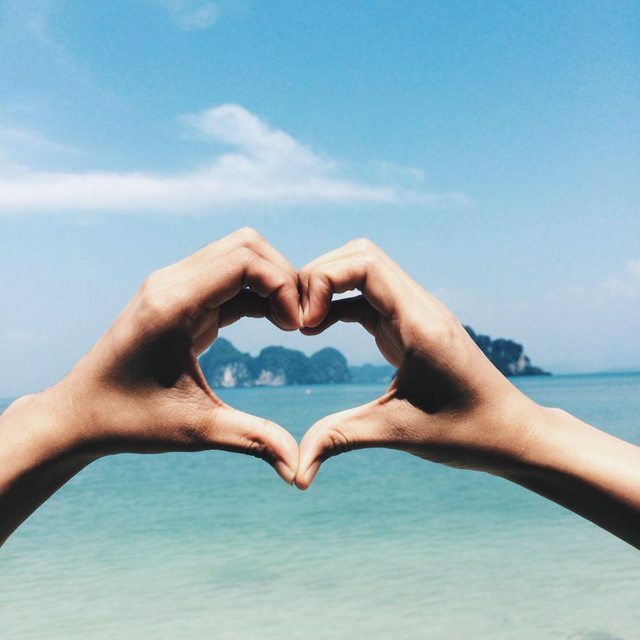 Finally, Koh Phak Bia! This is a lovely island and it is not as populated as the other islands, so we highly recommend anyone who wants some privacy to come here. 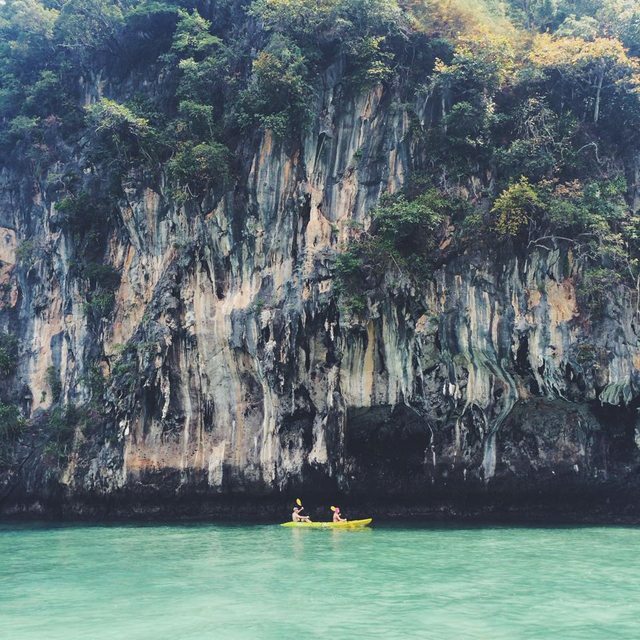 There’s also a cute mushroom-like limestone formation at the island. We were tired by the time we arrived so we just lazed around the beach, soaking up the sun. After about 45 minutes of getting roasted like a crispy duck under the sun, it was time to go back. We arrived at the hotel around evening and were famished! We had an early dinner which was really cheap! The pad thai costs 50baht (RM5) and the fresh watermelon shake for 50baht as well. After resting, we went out at night to see the nightlife and to find some snacks. 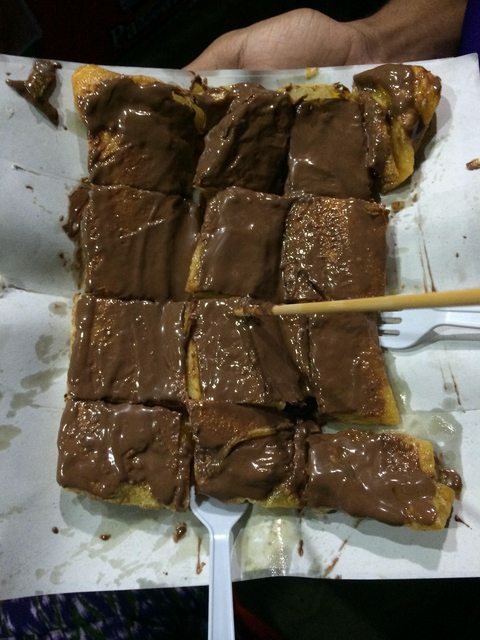 We tried the infamous Nutella banana pancake which only costs 20baht (RM2). Before embarking on the tour, we had our usual Family Mart instant nasi goreng and Milo which only costs 130baht (RM1.30) per box. 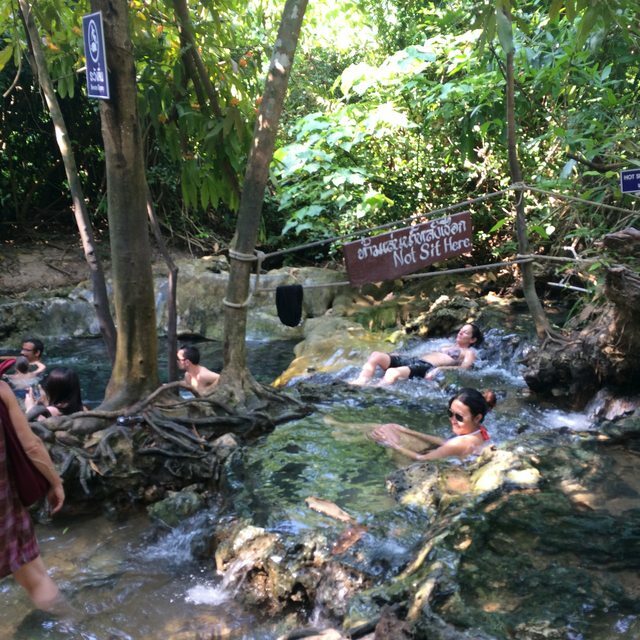 Our tour agent then picked us up and we headed to our first destination, the Hot Stream Waterfall a.k.a hot springs. There were a lot of people and mostly everyone who came swam in the pool. The number of people there kinda made us a bit rimas. Because we only had about 40 minutes or so, we just walked around and dipped our feet into the hot springs. Good enough. Later on, we went to the highlight of the day, Emerald Pool! It was kinda a loooong walk to the pool itself from the drop off point. The Blue Pool on the other hand, was another tiring walking distance from the Emerald Pool. 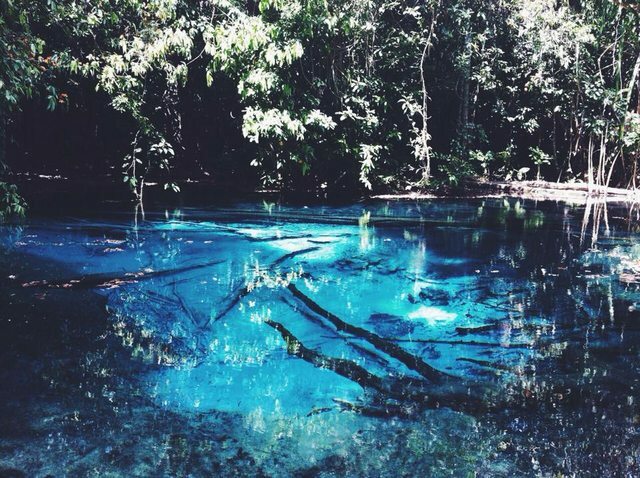 The Blue Pool was literally out of this world, it looked like some secret insane pool that Harry Potter and his friend would 'accidentally' find in the Forbidden Forest. It's definitely worth the walk! As usual, both pools were quite crowded as well. Word of caution though; be very careful while walking near the pool as some of us fell down thanks to the slippery rocks. After about an hour or so, we made our way back to the drop off point for lunch. 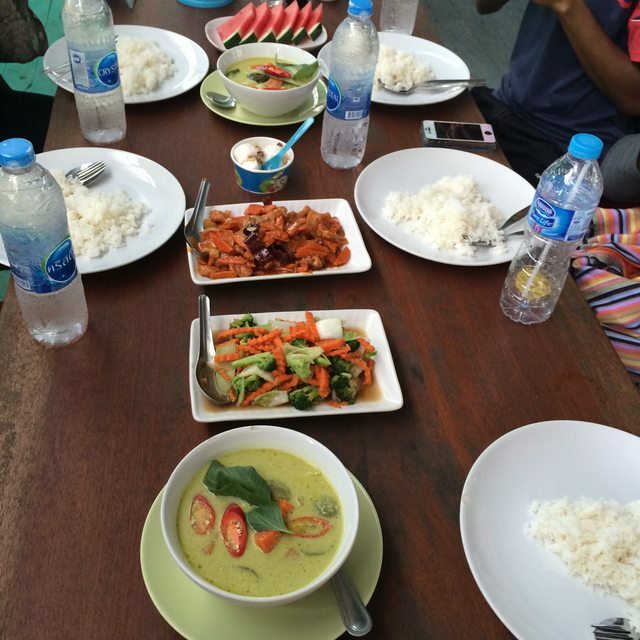 Three days into this trip, and we gotta say the Thais really put their A game on when it comes to food. The lunch provided was an enticing spread and the taste was real good, even Gordon Ramsey would give his stamp of approval. 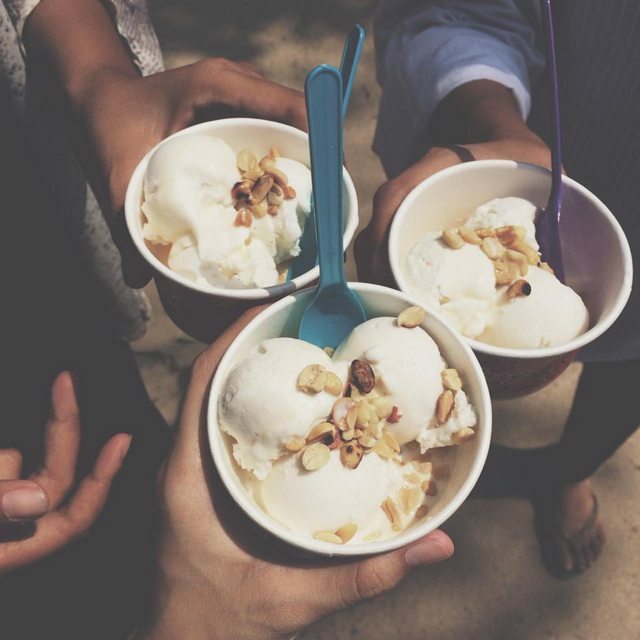 Before we left, we also bought some original coconut ice cream which only costs 20baht (RM2) per cup! It was cheap, it was fresh, and the only thing we would change would be how it is served. We wanted it to be served in the coconut shells, to be frank. 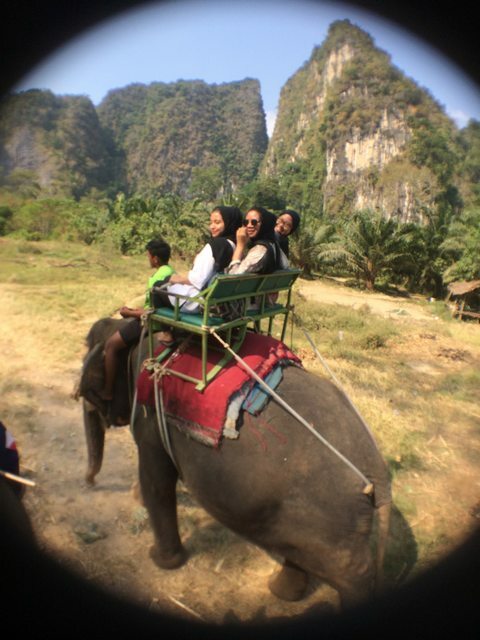 Finally, onto our last stop – the elephant ride. The elephants were surprisingly tame and friendly. We were kinda nervous because, obviously it was a first time for all of us. We trekked through the jungle and felt like Mowgli for awhile. 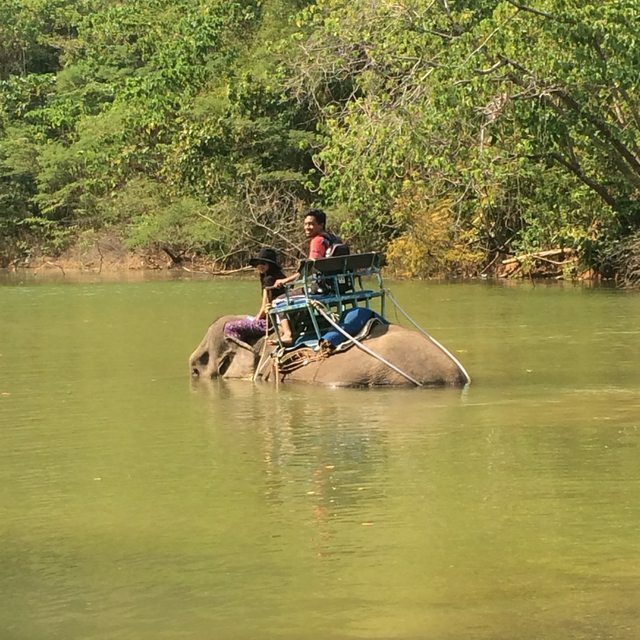 Before the ride ended, we stopped by a small lake where the elephants drank some water and took a dip in it. Let’s just say our elephant was really excited and he went really, really far into the lake. Our feet were wet and our hearts were racing at that point. It was nerve-wrecking as hell and thank God he turned back. It was indeed scary but it was a great experience! We arrived at the hotel in the evening. After getting some rest, we decided to have dinner and buy some souvenirs which were as low as 50baht (RM5). We bought some t-shirts which only costs 100baht (RM10) and the quality was surprisingly quite good. 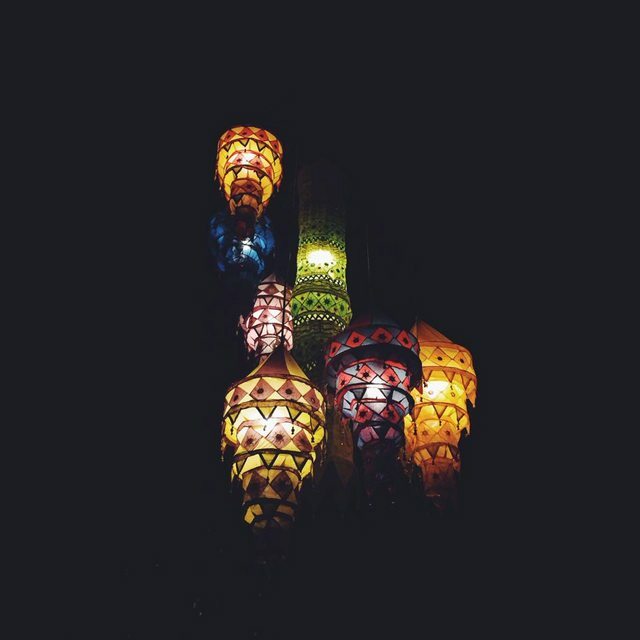 We then explored the streets and tumbled upon a lot of beautiful lanterns or light ornaments adorning the streets. It was the day we all dreaded – going home. We wish we could've extended our stay but sadly…nope. We walked by the beach one last time, to bid goodbye to our new favourite (and cheap) destination. Our flight was around noon so we left for the airport around 10am via a shuttle van which costs us 150baht (RM15) per person. Just a heads up though, the airport is quite outdated and they don’t provide Wi-Fi! You will mati kutu and starve while waiting for your flight as the food is priced bombastically. Therefore, it’s best you eat or grab something from the awesome Family Mart prior to making your way to the airport. 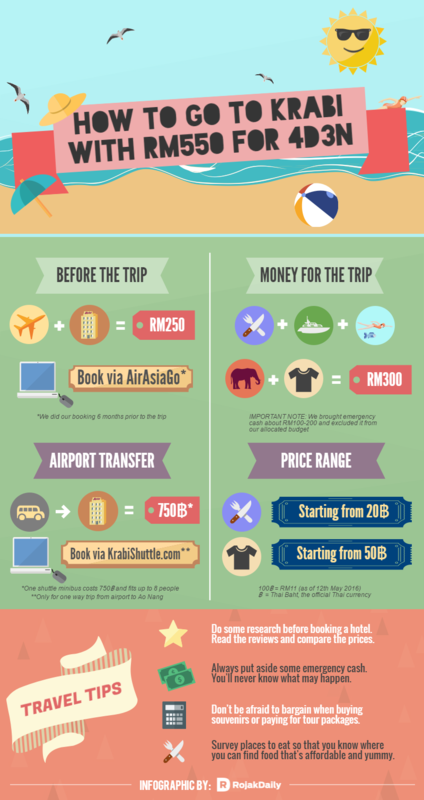 So…that’s how we survived our four-day trip to Krabi with less than RM600. Do you have any interesting money-saving tips or trips that you'd like to share? Tell us in the comments section.